Save USD$ 3 per day! You need to order at least 24 hours prior to collect Devices. Download your Voucher from attached file. Pickup & Drop-off points A is as follows. Deposit is required by credit card for extension or non-return. Cash or debit cards are not accepted. Drop off Devices at points what you designated. If you don’t return it, you shall be charged additionally for following Fees to your secured credit card. Feel free contact and advise us at least 1 day advance if you want to extend. Pay for charge of additional using period at this page. * Ready to use for Self-Care ! Tap Setting Apps on your own mobile device. Choose SSID, which is attached to Wi-Fi Router. Type the network Security key, which is attached to Wi-Fi Router. It works normally if signal strength LED are blinking in blue. The signal could be weak or out of service outside urban areas and in underground shopping arcades even in cities. Try to do steps below if your pocket WiFi has trouble. Check the network coverage of your location. Check the network Signal on your pocket WiFi. Keep the power off when not in use. Keep the device in a cool spot like in your bag. Hot condition may use up the battery. When you use the device in weak signal areas, the battery will die quickly as it uses as much power as it has to transmit the power. In other words, you can save your battery by using it in areas with strong signal. When you use the device in cold temperature like in snow, the battery cannot make use of the power to its maximum and it may not work at its best. 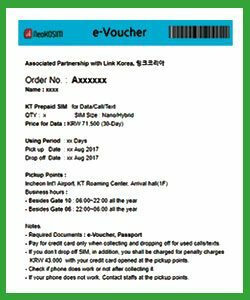 MY POCKET WiFi (KOREA POCKET WIFI) is strictly not refundable once used.